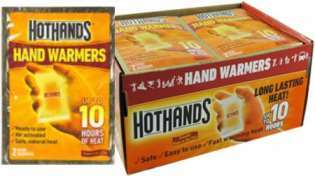 HotHands Name Brand Hand Warmer counter-top/retail display box. 80 warmers (40 pair) per display. Designed for skiers, bikers, hunters, fishermen, golfers, campers, paddlers or anyone who works or plays in the cold for long hours. Also great for keeping warm at spectator sporting events. HotHands-2 hand warmers are air-activated and will provide up to 10 hours of soothing warmth inside your heated accessories (sold seperately), gloves, pockets or wherever you feel a chill. Just open to activate.FRESH STOCK! Each HotHands warmer lasts 10 Hours. Individually sealed in easy open airtight packages. Each HotHands warmer lasts 10 hours or more. If you only use a warmer for a couple of hours, put it in an airtight ziplock bag to stop the warming action. Simply take it out and expose to air to use it again for up to 10 hours total. HotHands hand warmers allow you to stay warm all day for less than the price of a cup of coffee.